Bitcoin Energy Consumption – Does It Consume More Electricity Than Your State? This visualization looks at the staggeringly high energy use of Bitcoin and puts it into context: comparing it to electricity usage of US states. Unfortunately for Bitcoin, high energy usage is an intended feature of the system, rather than an unintended consequence. This is because mining is an increasingly energy intensive process, based upon increasingly computationally intensive calculations that are performed on high powered computers and graphical processing units. Currently, 28 out of 50 states plus the District of Columbia all have lower electricity consumption than estimated annual bitcoin electricity consumption (~73 TWh per year). These states are highlighted in variations of yellow. This is approximately equal to the average annual electricity usage across all US States. States with higher electricity consumption than bitcoin are highlighted in shades of red. When dividing the total energy use (73 TWh) by the current number of transactions (93 million), we get an average energy consumption of 783 kWh per transaction. 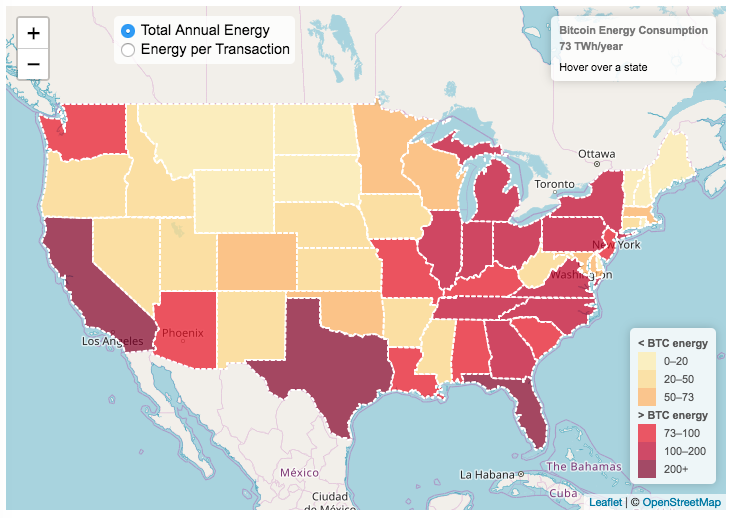 Click on the “Energy per Transaction” button to see this visualization. What’s crazy is that a transaction is simply a transfer of bitcoin between “wallets”, recording the transaction, and a validation of the process. There’s no good reason why verifying digital transactions should take this much energy, except that it was built into the fundamental process of validating and mining bitcoin. 783 kWh is larger than the monthly per capita electricity consumption in 10 US states. It could also drive you and your family over 2000 miles in an electric car (e.g. Tesla Model S). I’m not expert enough in this area to know how much more energy consumption will rise into the future, but if crypto advocates’ predictions come true and bitcoin is used extensively, millions of transactions will occur per hour instead of per year and the price of bitcoin may rise much higher than it currently is. If the price rises, then miners will be willing to expend more energy to “mine” the more valuable bitcoin. Needless to say, this sounds like a very bad idea from an energy consumption and sustainability standpoint. I added a simple spending flexibility parameter that allows you to specify how much you could reduce spending when your portfolio is below a certain threshold (in this case, your original retirement amount (inflation adjusted)). One of the key issues with retiring is the question of outliving your money. This is also known as Longevity Risk and is especially important if you want to retire early, since your retirement could be 50 years long (or more). 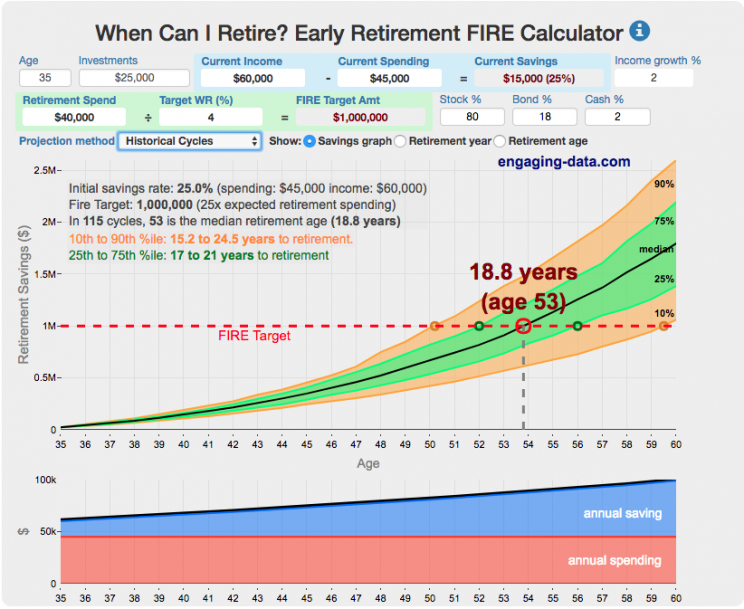 This interactive post-retirement calculation and visualization looks at the question of whether your retirement savings can last long enough to support your retirement spending and combines it with average US life expectancy values to get a fuller picture of the likelihood of running out of money before you die. It helps to answer the question: If I start out with $X dollars at the beginning of my retirement, will I run out of money before I die? Should You Invest (Or Wait) When The Stock Market Is At An All-Time-High? The stock market has been on a bull run (hitting numerous all time highs) for the last 8+ years and it’s not clear when it will end. Whenever there’s been an extended bull run, one question that comes to mind “Should I invest in the market now, or wait until a pullback?” The question comes about because of fear and loss aversion: fear that the market will drop right after they invest and the observation that people want to avoid losses more than they value gains. However, historically, the correct answer, at least over the last 68 years, has been to invest and not to try to time the market. This was also demonstrated in the Market Timing Game; that people are pretty bad at predicting the direction of the markets and given the upward trend of the market, it’s simpler and more likely than not, better to just stay invested in the market. The corollary to this is that when you have additional money to invest (e.g. from regular savings from your paycheck or a one-time event like the sale of a house), it makes sense to invest the money and not worry about whether the market is at a high or low point. Some graphs that look at the distribution of returns when the market is at an all time high (ATH) can help answer this question of whether you expect to see worse returns than investing at other times. Shall We Play A (Market Timing) Game? The Market Timing Game simulation is premised on the idea that buying-and-holding index investing and index funds are a no-brainer investment strategy and market timing (i.e. trying to predict market direction and trading accordingly) is a less than optimal strategy. The saying goes “Time in the market not timing the market”. 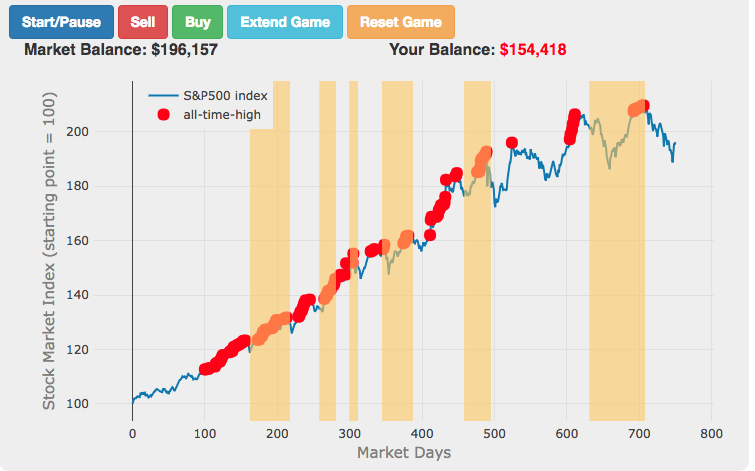 In this simulation, you are given a 3-year market period from sometime in history (between 1950 and 2018) or you can run in Monte Carlo mode (which picks randomly from daily returns in this period) and you start fully invested in the market and can trade out of (and into) the market if you feel like the market will fall (or rise). The goal is to see if you can beat the market index returns.